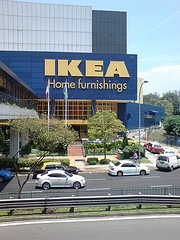 When it comes to sustainable business practices, affordable furniture and intelligible Swedish instructions, IKEA is the king of it all. They’re paving a path for retailers and creating trends in the industry to green up their operations, whether it’s using sustainable cotton or installing solar panels on dozens of stores. The UK sector of the company has pledged to use 100% clean energy to power its stores, an effort that if made by every large company in the world, would significantly lower emissions and the use of nonrenewable resources. There is no deadline set for the 100% renewable energy change, but by 2015, they are expected to reach 80% renewable energy use. The company recently purchased a wind farm in Huntly, Scotland, which will create 30% of their clean energy. The furniture giant already owns wind farms in Denmark, France and Germany. 39,000 solar panels are to be installed on top of the UK stores, an effort that will eventually save them millions of dollars. Steve Howard, IKEA’s Chief Sustainability Officer, says one of the biggest motivators for their commitment to renewable energy is to prevent increased energy costs. The wind and solar power will cut down on fluctuating energy prices, which cost them as much as $1.7 billion per year. Aside from IKEA, many other companies are hopping on the sustainable energy bandwagon, Google coming in as another frontrunner. IKEA has shown that making these changes is saving them hefty sums of money, so why isn’t every other large company on the planet doing it? Greenpeace is hoping Facebook will be next in line. The company has taken heat for powering their data centers with coal-fired electricity. Big or small, has the business or organisation you work at made any changes in the name of sustainability yet?